One Pretty Little Box: Been MIA ~ and it was much needed. Been MIA ~ and it was much needed. I know I have been a bit missing in action this week, and if you have been around for the last few (eleven) years you knew it was coming! I had spent a good portion of the week in Houston at a preschool teaching conference getting inspired and encouraged for the new year. While I LOVE LOVE LOVE every time I get to network and gather with like minded people (we preschool teachers really do have a different kind of brain than most people), it is socially and emotionally overwhelming as much as it is encouraging. I often leave the conference for the week with a brain of mush, moody from mental exhaustion, and very withdrawn from continuous social interactions. This year, was no different. One thing I can say though is it left me M.I.A but not in the way that I started this post. Sure, I didn't schedule any posts ahead, and that was partially my fault as I haven't spent a lot of time prepping ahead. I often do them on the weekend and last weekend was spent with friends and having a good time. It was break I needed, and well I enjoyed every minute of it. 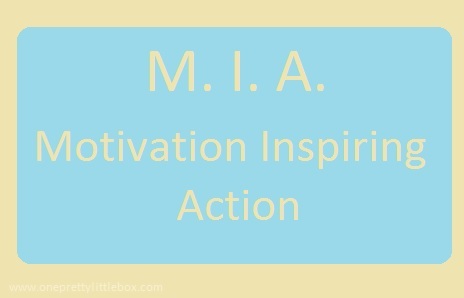 The M.I.A I was talking about was the kind in the picture at the top. 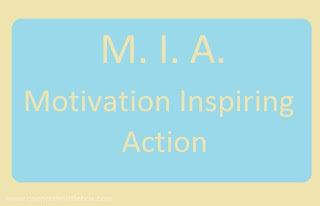 "Motivation Inspiring Action". It takes me a few days to process the whole experience of a preschool conference, and this afternoon I am finally beginning to feel much more like myself. It is in these moments that I realize how much inspiration comes from gathering with the staff at the preschool in which I work with and countless other preschool minded people. I would say at least 600 or so. I am one of these people who are like sponges though and take in more than just the average person. I am not saying I am better than anyone, just I am very in tune with people around me even if I don't want to be. Unlike many, I can process people's motives, emotions, and underlying "stuff" even if they do not want me to. I can't help it. Most times even I don't want to! What I have learned is our motivation inspires action and that can be positive or negative. We do not sit on motivation like a chicken sits on an egg. We do not bury motivation like a turtle will bury it's egg. No! We allow motivation to be birthed into inspiration and to take root deep into our being. If the motivation is positive this will lead to positive inspiration which then leads to higher energy levels, feeling of goodness, and a brighter vision for what we want to occur. It becomes crystal clear until that inspiration indeed inspires action that is positive and leads you to see that vision become a reality. On the flip side of that if the motivation we have is negative it will lead to negative inspiration (which sounds like an oxymoron), stress, anxiety, low energy levels. We create negative scenarios on our head, and begin to focus on all the things wrong around us. It sadly becomes crystal clear that we no longer have vision, and things become cloudy and we lose focus. When we do decide to take action it is nothing good. Gossip, slander, greed, etc. 1. God has desperately been trying to build my confidence in all that He has called me to do. I have been told several times how much I have inspired, encouraged, led, and motivated others ~ yet I was feeling like I haven't made any impact in this world. That was just a crock of nothing! 2. I was born to be in the preschool arena and my time there isn't complete. 3. I want MORE! I want to be more involved on other levels in our preschool beyond just the classroom. That desire has been building and as often as I might could be discouraged by being turned down for that advancement I realize that my time just hasn't been made available yet. Many times I am told "You are just too good to not take out of the classroom" but my rebuttal is and always will be "how do you know?" I want to do what I can to encourage other teachers, staff members along the way, but I completely am in awe of how highly others think so highly of me and my gift of teaching. Really ~ it is all Him! God leads me every single day in the classroom, even more so when I stay on my knees in that leading. So, instead of being discouraged I will be encouraged to just keep doing what I am doing until the opportunity arises. 4. I don't have to like everyone to respect them. 5. God puts just the right people in your life at the right moment for the simple reason that He loves you (and them) enough to teach you both a few things. Whether it is a blessing or a lesson... it is for His glory! 6. Changes are beautiful! Until we accept that it will be painful. I am so blessed to have been able to get over that hurdle though (for now at least). Thank you for hanging in there with me while I had a lack of posting this week. I am working diligently to make sure that the daily posting continues this school year! I am also working on something fun too for a few days a week! Ya'll have a GREAT weekend, and I'll "see" ya tomorrow!